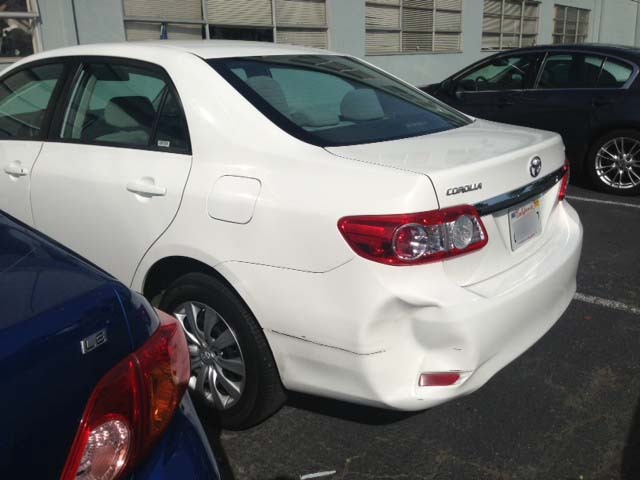 Customers often wonder how nicely a dented bumper can be repaired using the paintless dent repair method. Here are some pictures before and after a few recent repairs to show actual results. Please keep in mind – this is a fast, low cost, and convenient way to get dents removed when compared to the hassle and expense of having to leave your car in a repair shop for a few days. Large and small dents can all be repaired. It’s not the size of the dent that determines its fixability, the location and sharpness of the dent that determines how smoothly the panel can be reshaped with a paintless dent repair. 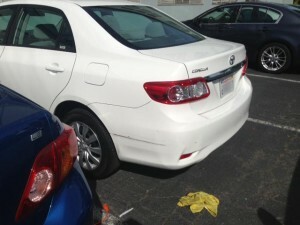 To see our results, check out this before and after dent repair example. If you’re wondering whether your dent can be fixed this way is to have a repair checked for its fixability by calling or sending a text message to 415-596-6090, with a picture of the dent; then Rob will tell you if it’s possible to repair. 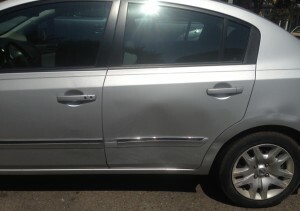 Click here for The Grateful Dent’s contact information. The phrase “paintless dent repair” might seem odd to someone not familiar with the term. Here’s what it refers to: a repair job that can be done without needing to repaint the surface of the area being fixed. The paint always matches because it’s always and only the original paint! There’s no need to try to match paint color. Nothing makes a repair stand out more than an off color painted repair. Usually the only way to get a paint repair to match is by repainting into both panels on either side. This is often an unnecessary expense for a minor dent. We’re mobile – there’s no down time for you. We don’t need a paint booth to complete your repair so you don’t need to deal with renting a car to get around while your car is being refreshed. It’s less expensive. Because we don’t have to add materials to your vehicle our prices are very reasonable. Usually a fraction of what a body shop would cost. The repairs lasts. Because we don’t use fillers or drill holes into the car there’s no need to worry about “bond dough” cracks appearing as the car ages. It’s environmentally friendly. 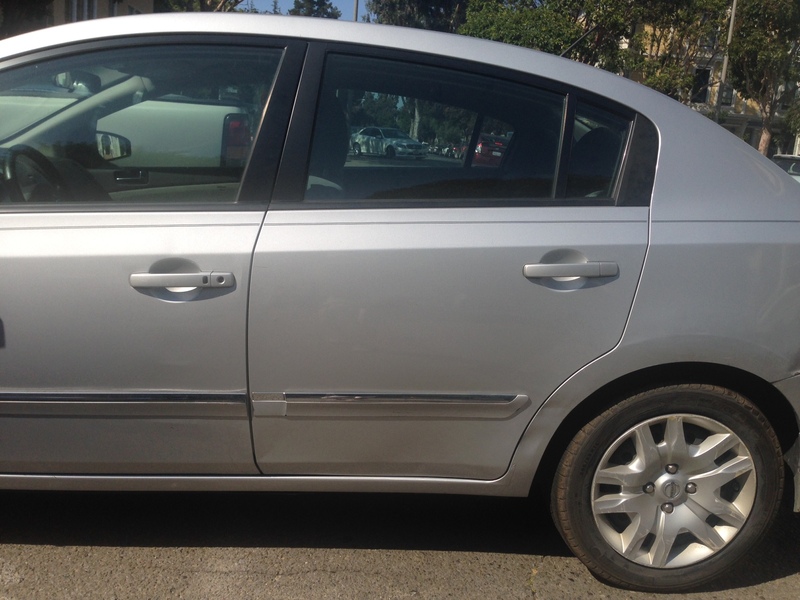 Since we use no harsh, industrial chemicals – our dent repairs are eco-friendly. Paintless dent repair is the low cost, low hassle way to repair an automotive vehicle after it’s been wrinkled, dinged or dented in a way that can be smoothed out when there’s little or minimal paint damage. We use tools to re-aligned and straighten the surfaces of a car or truck from behind the dent. We don’t drill holes or hammer away on the metal, we don’t use bond dough or other fillers. Since we don’t need to disassemble your car, we don’t need a big shop with a paint booth and high overhead. The end result is a low cost mitigation of the eyesore in a quick and eco-friendly fashion, without the need for you to drive to a shop or rent a car.